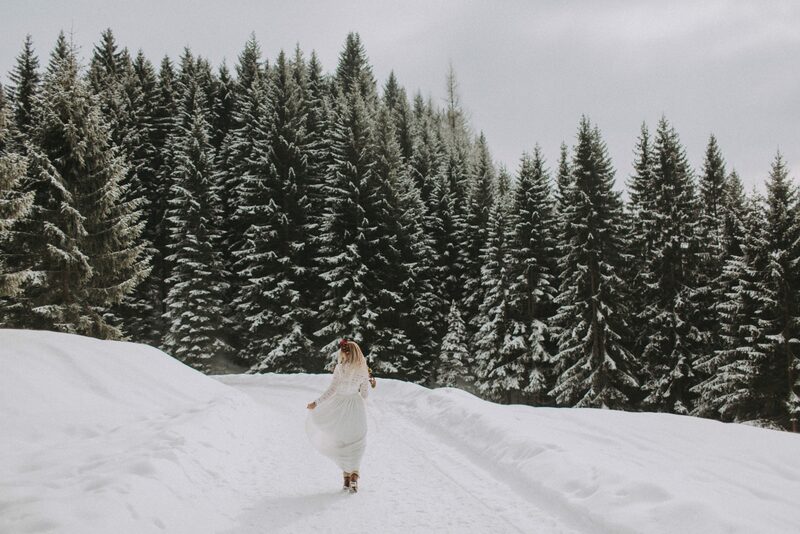 The cabin on a snowy mountain is exactly what you’d imagine when dreaming about a perfect winter wedding. 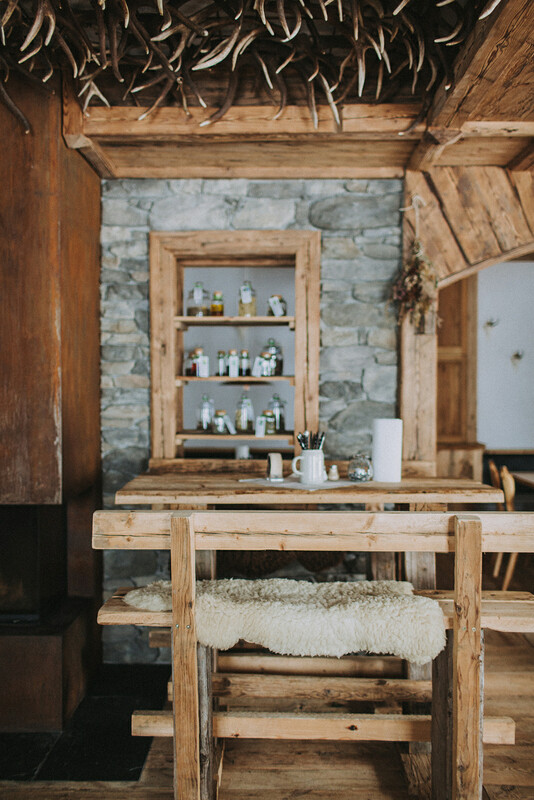 A lot of warm wood and a cozy fireplace create a rustic scenery. 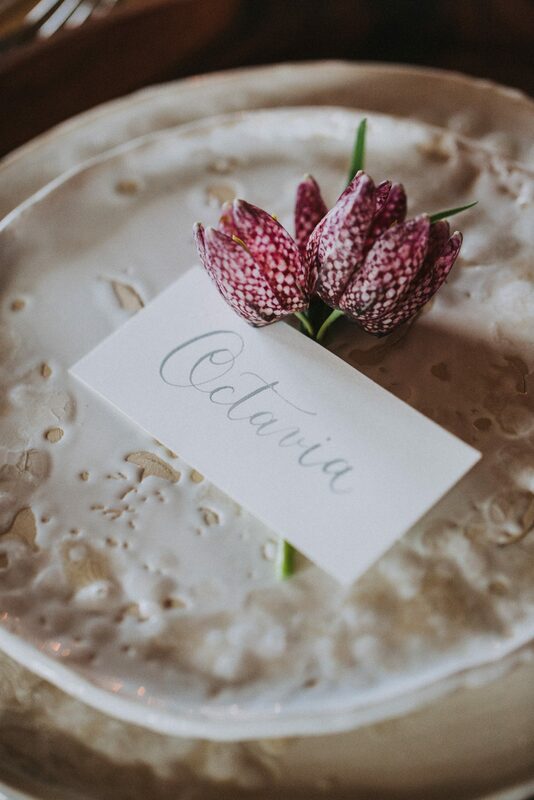 The venue offers a few accommodation facilities, which is perfect for the wedding couple and some loved ones. 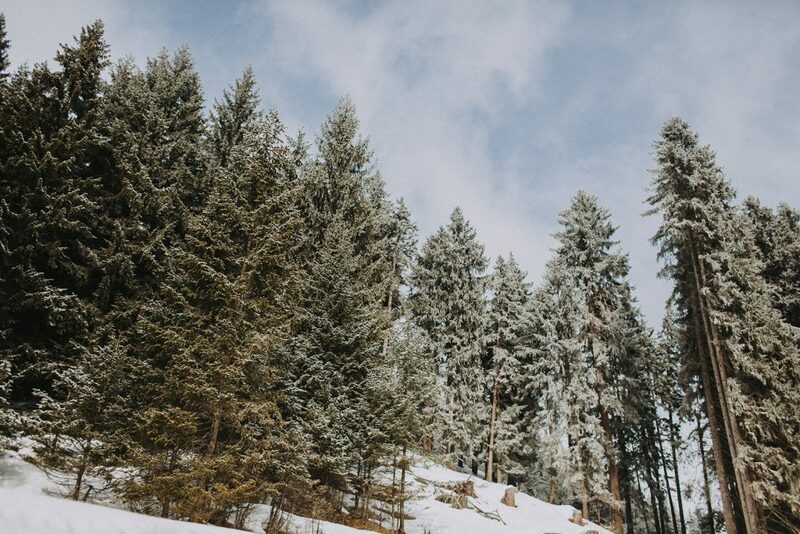 Due to the weather and the mountain, the cabin is hard to get at. 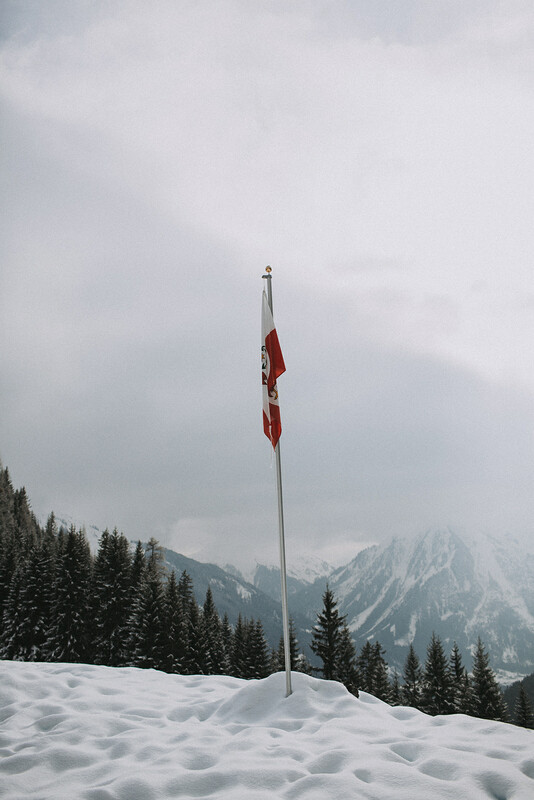 But if you made it, you get rewarded with a stunning view and a breathtaking landscape. 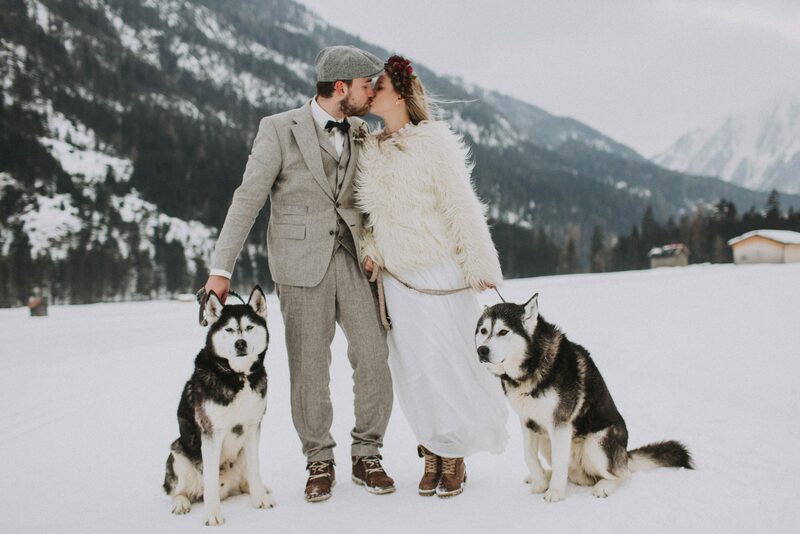 A unique and personal highlight for our couple was the sleigh ride with the Huskies, since both of them are huge Husky lovers. To get back to the valley you can take a fun ride on a sleigh. 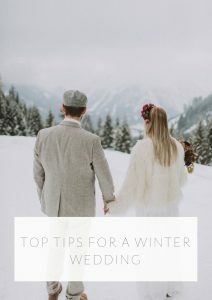 The styling for a winter wedding has to be comfortable, beautiful and warm. Therefore, the bride is wearing a long high-neck wedding dress with lace sleeves. The white fur jacket and the brown boots make her prepared for the cold weather. 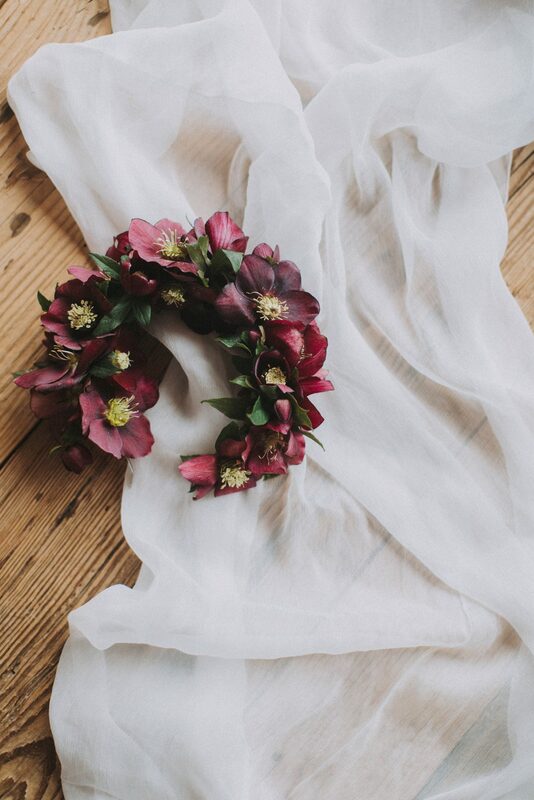 Loosely draped hair and a subtle make-up match with the natural and organic atmosphere of the wedding venue. 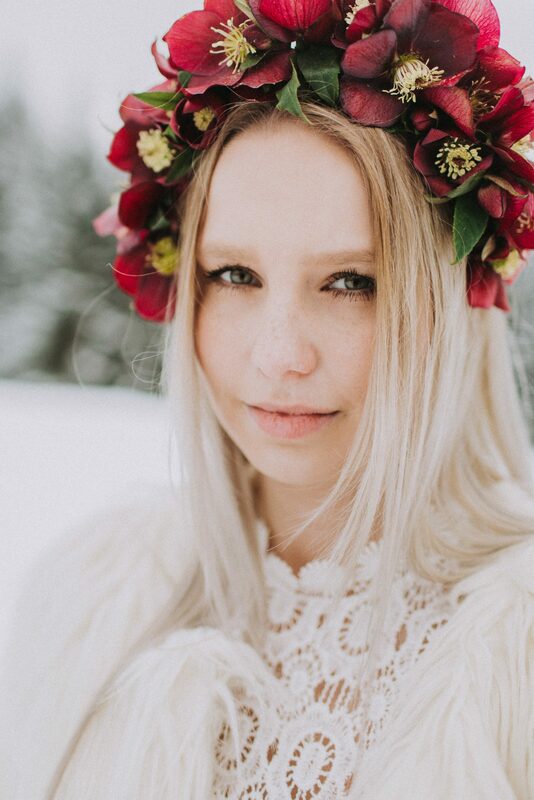 A deep red flower crown creates a festive and elegant look which is being emphasized due to the white surroundings. 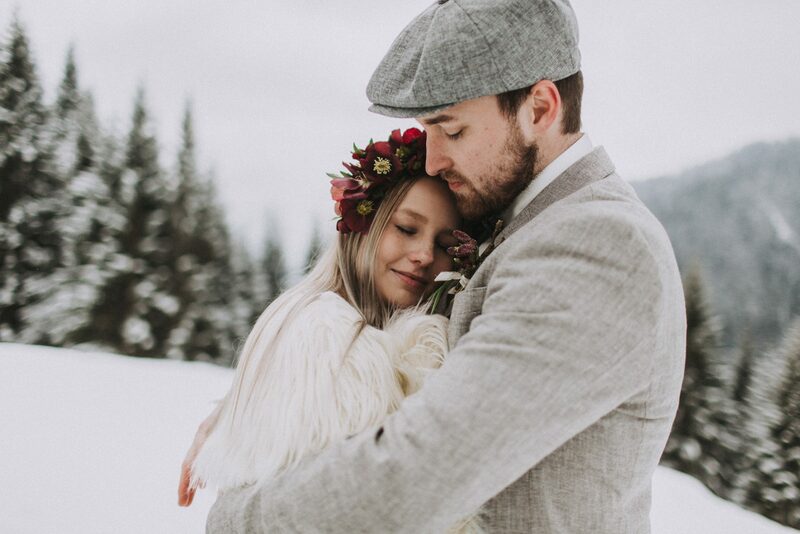 For the groom’s styling, the winter wedding motif is picked up. 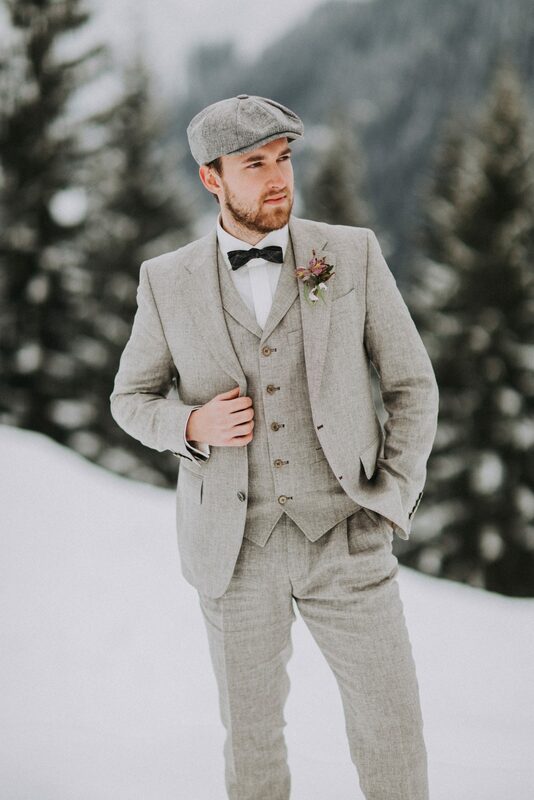 He is wearing a hat and a grey suit with a red boutonniere. 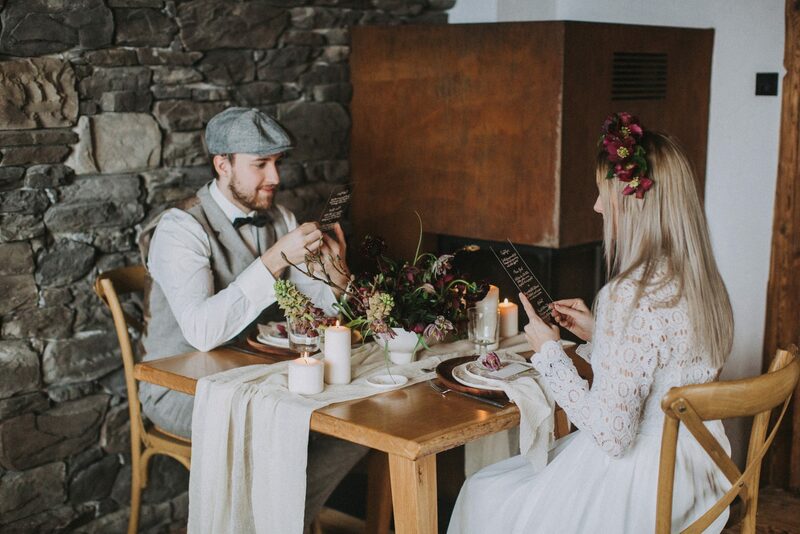 For the decoration of the dinner table for the two, we matched the rustic theme of the location. 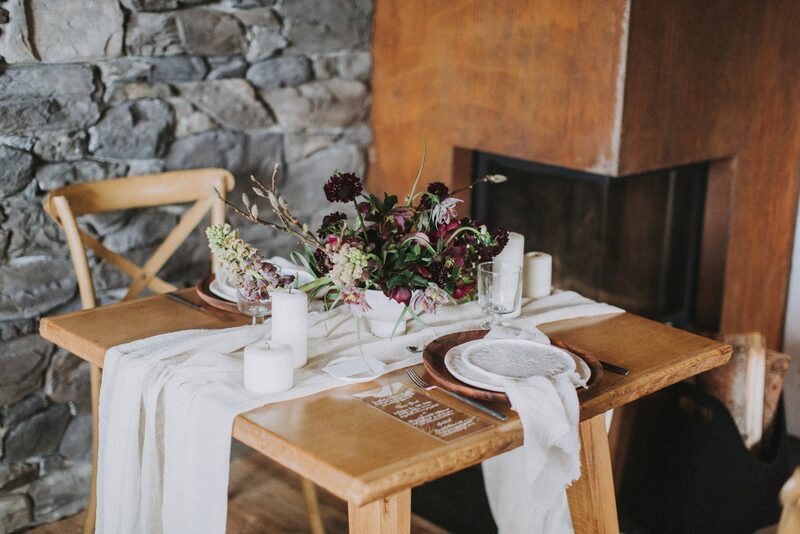 Hence the wood and the warm color scheme, the table setting was also kept in warm colors. 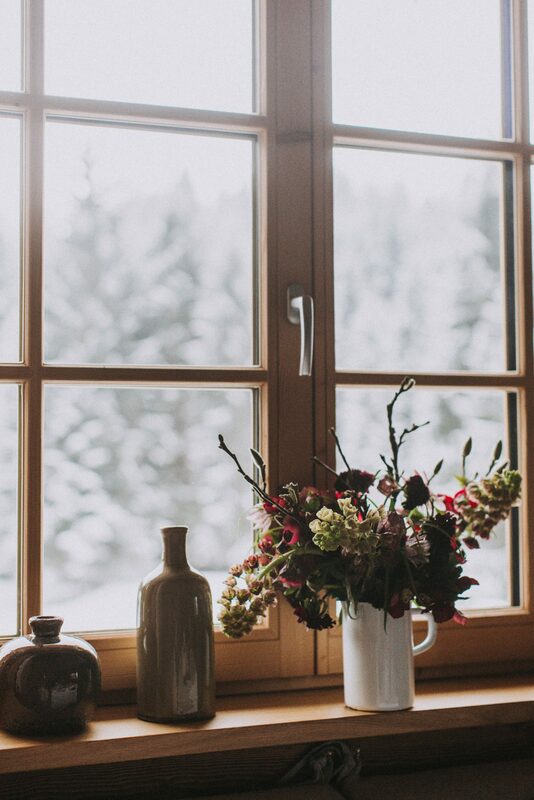 With cold temperatures outdoors, an inviting and cozy ambience indoors is very important. 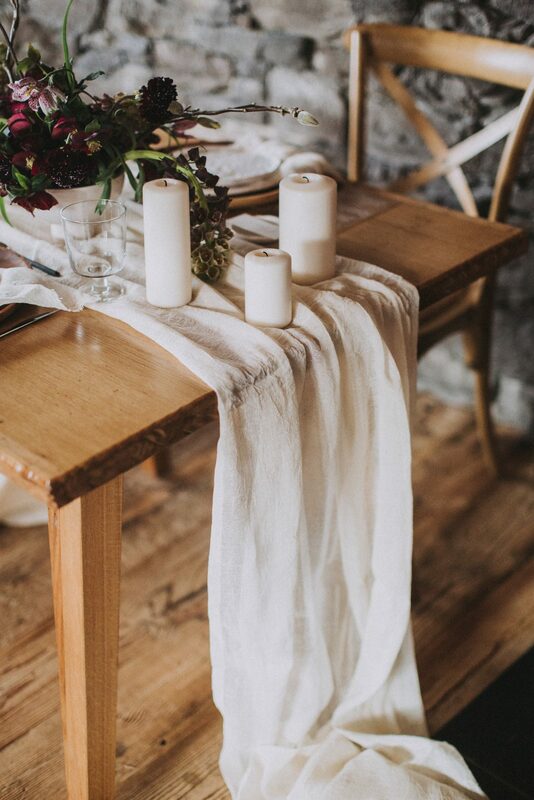 Napkins made of cheesecloth with open edges and hand made ceramic plates are amazing details to create a rustic feeling. 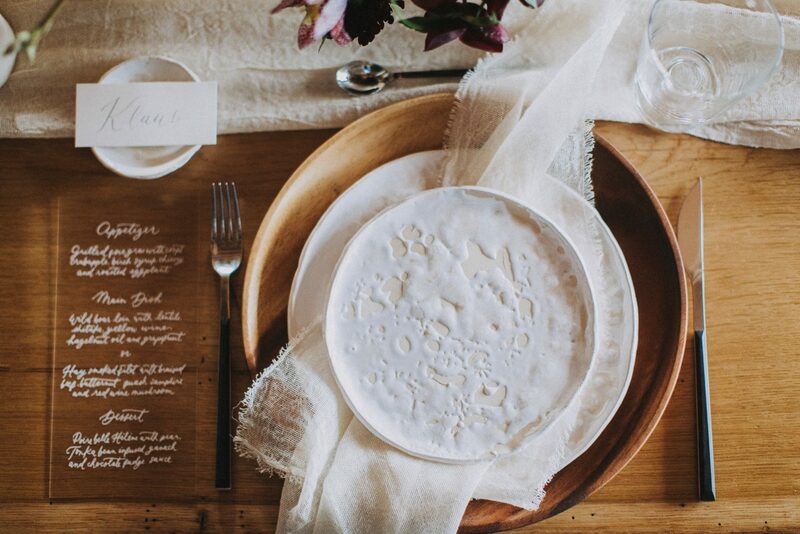 Cross-back chairs and wooden plates also contribute in the rustic and warm atmosphere. 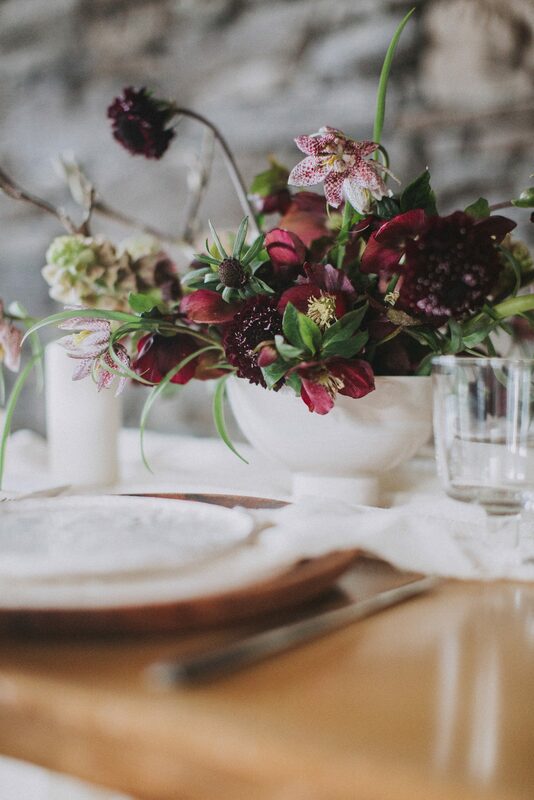 The warm red burgundy color scheme comes mainly within the floristry. 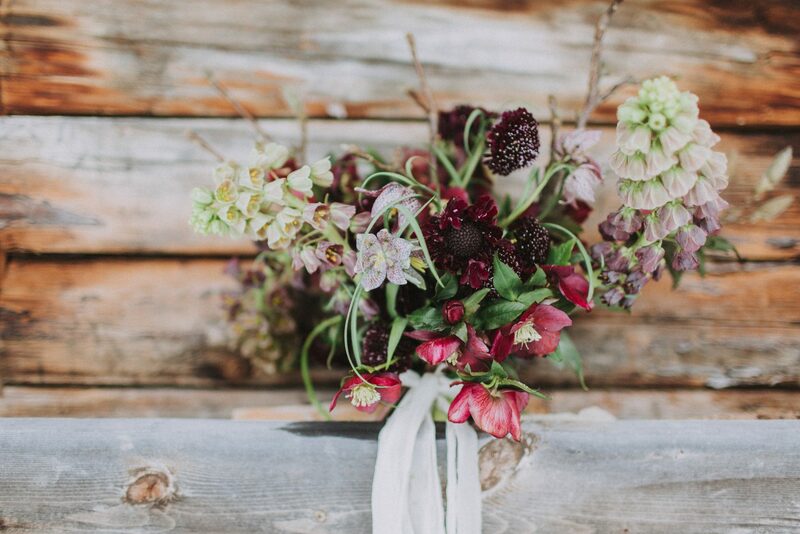 The bridal bouquet and the centerpiece are made of deep red fritillaria meleagris, also known as snakes head fritillary, twigs of magnolias, persian fritillaria and helleborus. 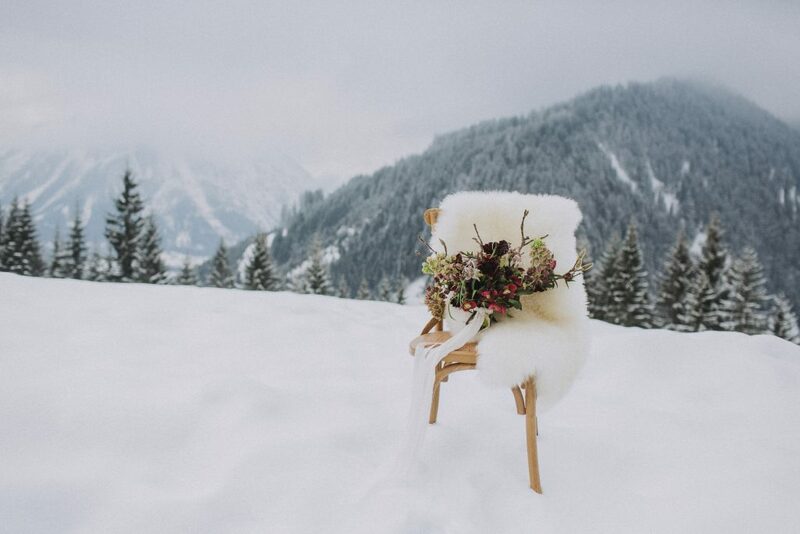 This red color palette appears festive, precious and it is especially highlighted in the white snowy scenery. 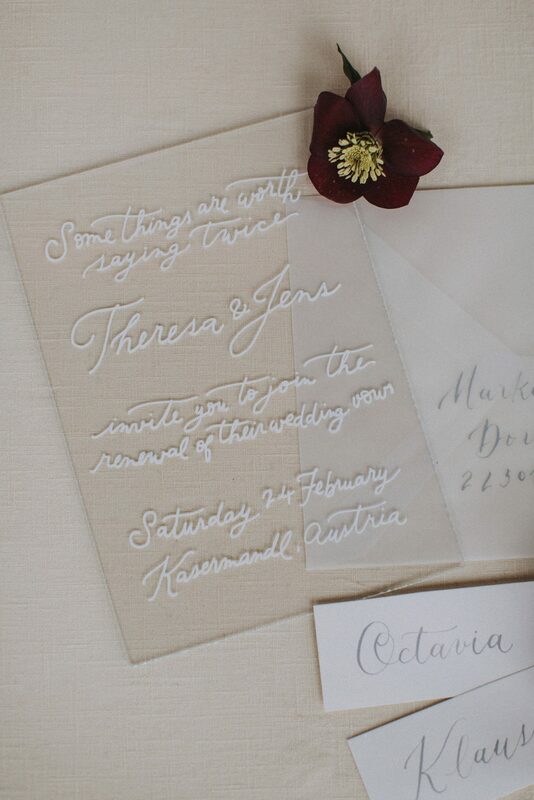 The wedding stationary is designed with the intention of contrast. 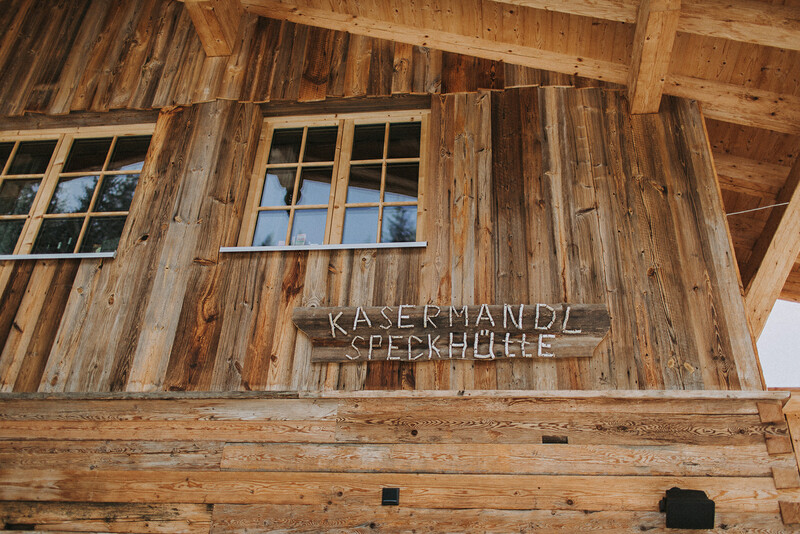 The white and transparent acrylic and paper with the white and blue grey calligraphy are a metaphor to the ice and snow. 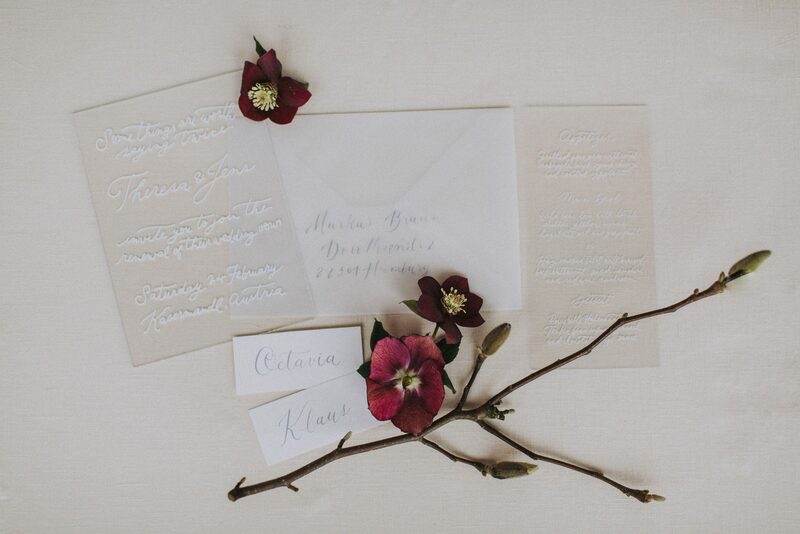 The modest and cool elegance of this stationary is a beautiful and modern contrast to the warm and inviting motif of the winter wedding decoration. 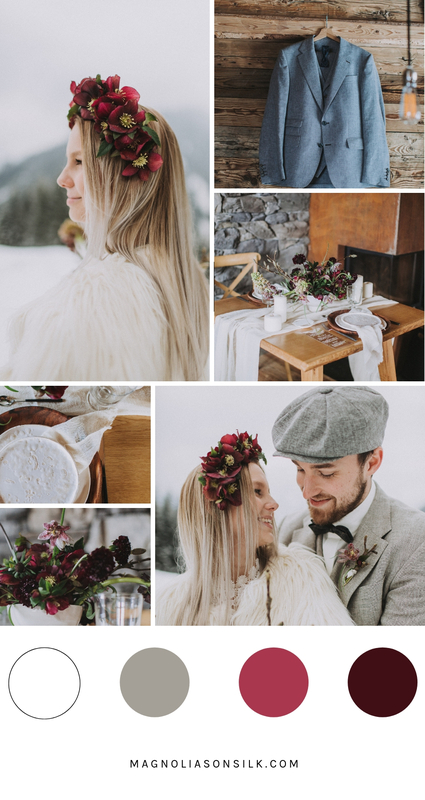 Did you like our winter wedding inspiration shoot in the snowy mountains of Austria? 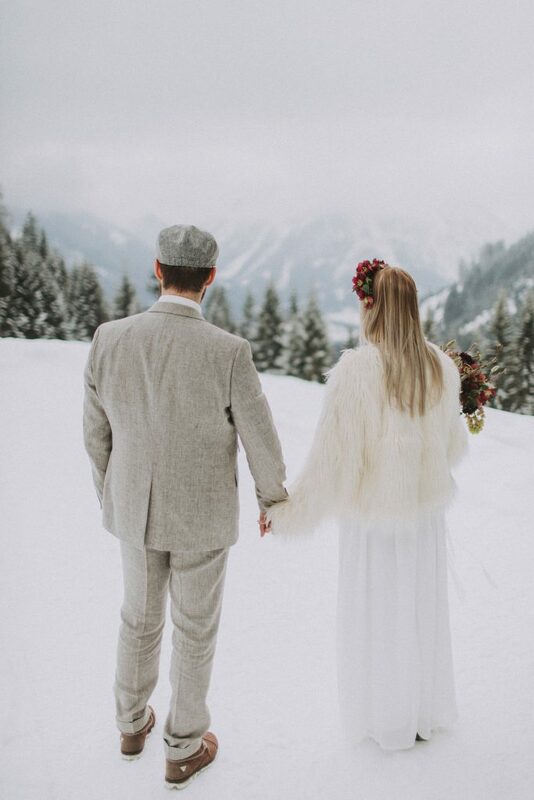 If you wand to get married during the winter time, you may be interested in our ice princess blogpost where we present a winter wedding decor in soft pastel tones.